E.g. a score of 20 scales to 28, 35 scales to 44. There are not many subjects that receive similar bonuses. Most of our VCE students come for private tuition in order to work on their individual strengths and weaknesses. Congratulation to all our 2016/2017 VCE students. Well done! We are so happy that you all got into the uni course of your choice. Private class prices apply ($85 per session; 10% discount if you pay 10 hours in advance). You could also have Skype classes which has proven to be very convenient as well as effective. Or you could try a combination of both. Talk to Katharina or Carolin about the best option for you. You could start at any time, but do not wait too long! Languages take time to learn and the sooner you start, the better your result will be. All our group Conversation and Grammar workshops in the term breaks would also be very helpful for year 10, 11 and 12 students. Being partly bilingual I always thought that I did not need any extra help with my German but once I was deep into essay writing I realized there are certain challenges that arise from this mindset. A huge flaw of mine was grammar. It is easy to fall into the trap of neglecting grammar as a bilingual because a lot of the time, sentences simply fall into place. But literally after even just one intensive grammar workshop I suddenly started to get a much better idea of the actual grammar rules, and was able to iron out my mistakes. I then also had some private classes to prepare for the actual exam, which obviously is a huge help for little tips and tricks, oral practice and more writing feedback. You gain a lot of confidence this way I find and I highly recommend this approach if you want the edge. Almost two years ago I was ready to quit VCE German. My marks were not good at all. Particularly the task of succeeding in speaking assessments was very daunting. I found that my low confidence in speaking German was my greatest weakness. However after beginning tuition at the East Melbourne Language Centre I found that my German was greatly improving. My confidence was increasing greatly and also I began to grasp grammatical concepts that were previously confusing. 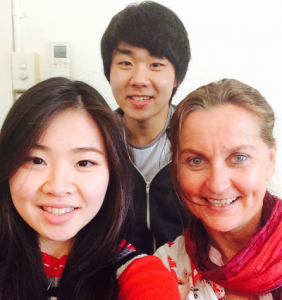 My time at the East Melbourne Language Centre included private tuition and also frequent workshops. I feel that my time at the East Melbourne Language Centre has been greatly beneficial for my VCE German and I have discovered some success in the language. It has helped me discover the fun of learning a second language and for this reason I recommend the East Melbourne Language Centre to all VCE students who are learning a second language. I got a raw score of 31 which scaled to 40!! Very happy! As a VCE student undertaking German in year 12 I wanted more practice for my German skills outside of the classroom, and so I took up the Skype classes offered by the East Melbourne Language Centre. The classes were able to fit around my school schedule and were flexible for my needs, whether it was speaking or grammar practice. Through the classes I was able, not only, to practise speaking for the oral exam, but to go over my work for assessments during the year and the written exam at the years end. These classes made an incredible difference to my confidence levels and the ability to practice German weekly made it possible for me to retain and revise my knowledge through-out the year, I recommend the classes highly for those who want extra practice and a confidence boost! 39 scaled to 47!! “Having grown up speaking two languages at home, learning German was a challenge unlike any other I have had to face before. Something I thought would come easily to me proved to be a struggle in the early years of high school, and I had very little confidence in areas such as speaking and grammar. I was introduced to the East Melbourne Language Centre through a friend, and it was one of the best discoveries I had during VCE. Not only did the sessions greatly improve my confidence in all aspects of the language, including grammar and speaking, I also found this confidence translating to other areas of my study. Everyone at the Centre truly cares about your learning and growth as a student, and through one-on-one classes and small groups I found that I was able to learn more effectively than in a larger classroom setting. I would greatly recommend the Centre to anyone looking to gain more confidence in their language skills, or simply a new outlook on German.”Raw 45 scaled to 50.45!! Thank you! !